Welcome to the offical web site for the band TAXI. Originally formed in the 1970"s the band gets together for special occasions to bring back the sounds of the good old days. The band members are local boys hailing from Cliffside Park, Fairview, Ridgefield and Palisades Park. Still active musicians playing in bands rangeing from night clubs and oldies bands to wedding bands and two of the members are local music teachers, the boys are still TAXI at heart. 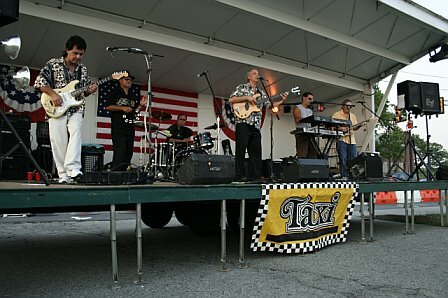 From classic rock and roll to some of today's hit songs there is always a good time when TAXI hits the stage. Thanks to everyone who supports our gigs. Look for us in 2017. We also play private parties and weddings. We are still playing your favorite classic rock music. Would you like TAXI to play at your private party? You can contact us for more info. Thanks to everyone who comes out and supports our band and the shows we do for special causes.